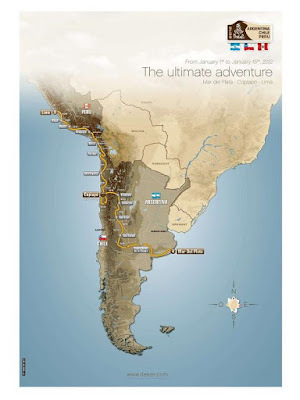 At a little over 9000 KM long, this is going to be quite an epic Dakar Rally in 2012. The route runs from Mar Del Plata, Argentina to Lima, Peru. Running across Argentina, over the Andes Mountains and through the Atacama Desert, this year's rally should prove to be fantastic, as always. See the Dakar Series website for more information about the upcoming rally.